A new year is upon us! For a lot of people, a new year comes with a resolution of change. But when we talk about the beautiful format Vintage, change isn't necessarily applicable. Instead, raw power and knowledge about harnessing this power is key to both start making the top 8 of tabletop events and perhaps more importantly to qualify for the Mythic Championship through the Magic Online Vintage Championship. My love for Magic in general, combined with my fascination and nostalgia of playing with old cards, have led me to the point where Vintage is one of my favorite things to do. Every Saturday on free weekends, Andreas, Thomas and myself have played our hearts out. We tried to become known entities in the Vintage community and win some chests, play points and more. This culminated in an invitation for the Vintage Super League (read about VSL Season 9 here) and eventually our duel against LSV:VSL in the finals. Watch a (Paradoxical) Outcome here. In this article I would like to tell you how to play and win with the best deck in the format. Soon I’ll be back to tell you what to look out for when you play against the other top decks and how to sideboard against the field. The Engine of the Deck: Why the outcome often favors us! When we play Vintage, we get to play with some of the most powerful and iconic cards ever printed. 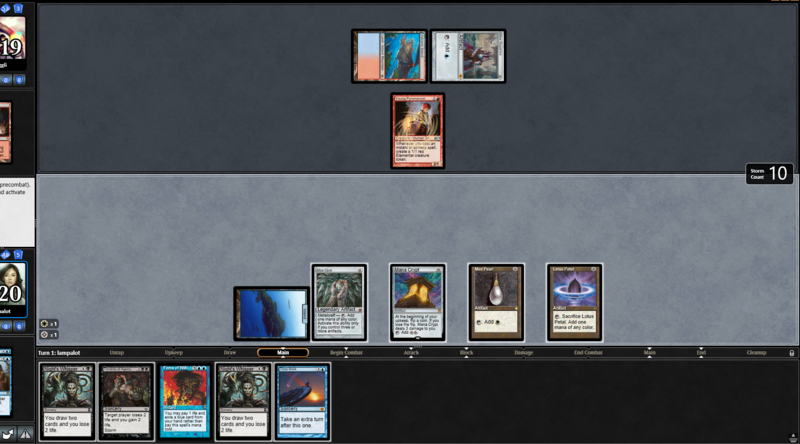 Although they are all restricted (other than Mox Opal) there are still enough to make the deck's namesake card insane. Paradoxical Outcome (henceforth abbreviated to PO) becomes everything from a draw-3 to a draw-7+ for just 3U. When you get 3U from Mox Opal, Mana Crypt and Mox Sapphire, you get to draw 3 cards for 0 mana total. You simply redeploy the mana accelerants after resolving the Outcome. When you put Sol Ring, Mana Vault and more Moxen into the equation, you get to float a ton of mana, play everything again, and most likely draw your entire deck in several chunks. Alongside this insane draw engine, we get to play all the Blue draw spells and tutors for either PO or other key pieces late in the game. And with a lot of blue cards comes protection in Force of Will – so far, so good! Technically, drawing many cards doesn’t end the game. Monastery Mentor, Blightsteel Colossus, and Tendrils of Agony. The latter requires a more combo heavy shell. You often play it in lists without Blightsteel Colossus. Another way to “win” the game is the powerful combo of Time Vault and Voltaic Key. That way you can take all the turns and then eventually kill your opponent easily with any of the other win conditions! Blightsteel Colossus is a card that you should only play if your list contains Tinker. The cool thing about Tinker is that it is also a way to fetch our Vault/Key combo. These two options, coupled with some corner case scenarios where you dig for Sensei’s Divining Top or for some kind of mana, make me like Blightsteel Colossus a lot. Its biggest downside is a vulnerability to popular cards like Hurkyl's Recall, Dack Fayden and Phyrexian Metamorph. On the plus side, it can win some games that would have been almost unwinnable otherwise. It also cannot be effectively discarded since it returns to the deck when it would go to the graveyard. That gives us a win condition that survives almost all disruption in the format besides Swords to Plowshares, although compared to Legacy, people play that card a lot less. Monastery Mentor is the evergreen win condition in Paradoxical Outcome. If you can play it on turn 1 you get triggers from roughly 70% of your deck. Not only is the card itself hard to deal with, but it just generates unlimited power after every draw step, which will most likely overpower your opponent. In some other games you don’t really see or need it before you have already effectively won. Either you have established a lock through infinite turns or you just drew enough cards that you have several safeguards before you deploy it. Tendrils of Agony does somewhat the same as Monastery Mentor. You just need enough Storm during the turn. It is a good secondary win condition if you shave on the Blightsteel/Tinker package. Never touch the Vault/Key package though. There is one main difference between Tendrils and the other win conditions besides the necessity of a storm count. It plays around Force of Will, which is a maindeck card. On the other hand, it is worse against Flusterstorm, mostly a sideboard card. Overall, it’s a better card against the Blue decks and worse against the taxing decks. Since I mentioned the Voltaic Key and Time Vault combo as a win condition, I will also mention that a lot of decks in the current metagame play Null Rod. Alongside Null Rod, cards like Ancient Grudge, Nature's Claim, Abrade, Mental Misstep and even Hurkyl's Recall can put us in a hard spot. Especially if we use too many resources to assemble the combo. However, in some spots there is almost nothing that our opponents can do, and then it’s just game over. It is hard to identify these spots, but in a lot of games you have to go for it naturally or you fight for resources and then it’s there to close the game! As a side note: I would play the card Yawgmoth's Will if your plan is to win with Tendrils and Mentor. For that path you can find some inspiration from thepowernine on MTGO. A great and dedicated Vintage player who fights for glory every Saturday – and one of the reasons that Ecobaronen was able to make the sweet Vintage Power giveaway! It generates infinite turns with Time Vault, which suits for a pseudo win condition. When we tap our Sensei's Divining Top, we can hold priority and then use the untap ability of Voltaic Key. Then we tap the Sensei's Divining Top once more to draw one random card and redraw the Sensei's Divining Top. A smart little trick is to activate the other ability of Top in between the two draws, to get to re-arrange the Top and the two cards under the Top. It generates one extra mana with Sol Ring or Mana Crypt and two extra with Mana Vault. Voltaic Key helps us to untap a Blue, White or Black source of mana, when we have a lot of colorless mana floating around. We can give Blightsteel Colossus pseudo-vigilance. This has never come up for me yet, but I would love a screenshot of it! And maybe a top contender: Any of the above, before we bounce with Paradoxical Outcome and get to do these shenanigans all over. Only will we have even more cards from the Sensei's Divining Top trick or extra mana from Mana Crypt, Mana Vault or Sol Ring. With all of these in the back of your head, I am sure you will come to the right conclusion on your own! I will leave you all for now and return in a couple of days with the specific matchups and how I approach them. I currently have 17 Vintage Format Points – so there is a little more grind to be done. If you are up for this, stay tuned and get ready to sleeve up a deck!